Market Research firms understand the importance of recruiting for focus groups, surveys, or individual interviews. 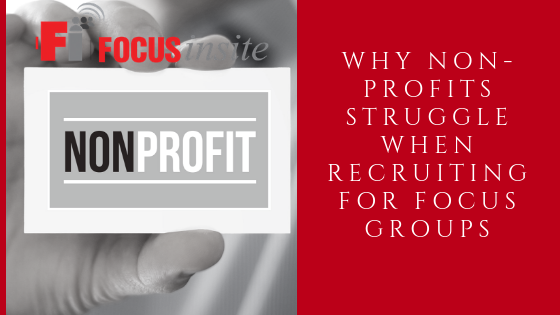 They spend considerable time, thought, and money on recruiting, and will often outsource this critical function to professional recruiting firms. Market researchers know that if they don’t have the right people for their studies, their end results suffer. In short, market researchers understand that recruiting the right people for the right study is essential to the success of their project. Contrast this to non-profit or public sector organizations that rely on focus groups to steer policy or help allocate public dollars. These groups tend to minimize the importance of recruiting participants, and often underestimate the challenges with doing so. It isn’t that these two sectors don’t care as much as market researchers, but more that they operate within environments with different rules, procedures, traditions, and constraints. Employees of public sector or non-profit organizations may feel that given the values and traditions of their respective organizations, they must be transparent and conduct meetings that are open to the public. While these are important values, they don’t necessarily work for focus groups. Why? Because focus groups aren’t public meetings open to anyone who is interested. Focus group participants are curated to be selectively representative of the broader community, and are conducted in such a way so that participants feel comfortable in sharing their thoughts and reasoning behind their decisions. If focus groups were run like a typical public hearing, it is very likely that results would be skewed and that only those passionate about the subject matter would show up, thus further biasing the results. Consider the example of a municipality that wanted to build a new library. The main library was at capacity and the town’s population had grown considerably over the decades placing great strains on the current library space. A new library couldn’t be built without passing a bond measure, which the city employees knew would be a challenge, especially since past attempts at passing bond measures to build a new library had failed. City officials decided to hold focus groups to see where the sticking points might be in getting the bond measure passed. They recruited for these focus groups on the city website, on community radio, on flyers posted in the library, and by placing ads in the local newspaper. As you can imagine, the people who showed up for these “focus groups” were people who felt the city needed a new library and wanted their voices heard. Their opinions were heard, yet the bond measure still failed. Wanting to learn why the measure failed even though the “focus groups” all pointed to an enthusiastic backing of the measure, the city hired a market research firm to analyze where they went wrong. It didn’t take the market researcher long to see that what the city considered “focus groups” were actually more like town hall meetings, where everyone was welcome and no controlling for a broad representation of voices was implemented. While the city was practicing its values of openness by inviting anyone who wanted to share their opinion, they ended up with a very biased result because the “focus groups” weren’t properly recruited for, nor were they limited in size. There is a happy ending to this story though. After working with a neutral market research agency that conducted proper focus groups and broad surveys with citizens, the city learned where its weak areas were and were able to tailor a marketing campaign to address some of the concerns and misconceptions that citizens had surrounding the bond measure. The next time the bond measure was put to the voters they passed it. Recruiting requires special efforts and non-profit and public sector organizations should put aside their normal course of soliciting public input and adopt a more deliberate and selective process when recruiting for focus groups. Getting the right people and the right number for focus groups requires a different form of recruitment and sometimes a different skill set altogether. To be truly successful, it’s best to leave the recruiting to a neutral recruiting agency that is experienced and skilled in recruiting, screening, and then managing the participants from beginning to end. Looking to recruit for your next project? Contact us here to request a proposal.